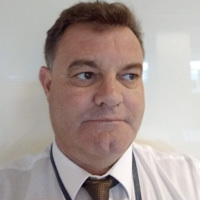 James McLachlan is the Director Remediation PFAS Investigation and Management Branch, within the Australian Department of Defence. The role of the Remediation Directorate is to identify and implement effective PFAS remediation initiatives, consistent with Government policy, collaborating with Government stakeholders within the Australian Commonwealth and across State/Territory jurisdictions. James McLachlan joined the Department of Defence as an Australian Public Servant in 2000, after serving in the Royal Australian Navy. Since 2000 James has had various roles within the Governance, Finance, Contract Management and Service Delivery areas of Defence. James has been seconded twice to operational theatre within the Middle East as the Middle East Area of Operations Business Manager. James was promoted to the Director of Business Operations Northern New South Wales in 2013 and served as Regional Director Northern New South Wales prior taking up his present position within the PFAS Investigation and Management Branch in 2017.